The roots of McLanahan Corp., which celebrated its milestone 175th anniversary three years ago, trace back to founder James Craig McLanahan. But it is largely James’ son, Samuel Calvin McLanahan, who is credited with taking a company with an iron foundry and launching it onto the course for which it’s on today. Samuel Calvin McLanahan, who developed the first accounting system for his father’s company at age 14, purchased one-sixth of the family business more than a decade after serving in the Navy during the Civil War. He continued as the company’s general manager for more than 20 years. 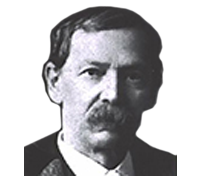 Between 1880 and 1902, Samuel Calvin brought numerous inventions and modifications to the aggregates industry. Perhaps his greatest contribution is the Log Washer, for which Samuel Calvin secured a patent in 1891. The Log Washer was originally designed for iron ore, but McLanahan discovered it could be applied to other areas. Now, over the course of 122 years, the Log Washer has become an industry staple for its ability to remove tough, plastic clay from natural and crushed gravel, stone and ore feeds. Samuel Calvin later recognized another industry need – one for a simple primary crusher that could handle wet, sticky feeds that contained pieces too large for the Log Washer. The single roll crusher, which came to market in 1894, was McLanahan’s answer. Originally used in limestone crushing, the single roll crusher was an ideal alternative at the time to jaw crushers, which would pack with clay. “The Log Washer and the single-roll crusher were the two machines that were instrumental in changing the face of our company from a foundry to a machinery manufacturer,” says Michael, whose grandfather, Ward, told glowing stories of Samuel Calvin. Samuel Calvin, whom Michael says was capable of drawing up a complete machine over a mere weekend, continued to update and improve the company’s equipment designs during his tenure. Some of the other things he modernized or modified were screens, conveyors, crushers and dryers. “We have a great deal of pride in honoring our ancestors,” Michael says.